Sometimes we download a video in our PC and when we try to play that video in our mobile, it says unsupported item. This means, the video format downloaded originally is unsupported in our mobile device. We all know that each mobile, tablet and iPod supports different video formats. And we also know that we can’t download each supported format one by one. If we do so then it will a waste of time as well as money. So we need a permanent solution for this problem which saves our time with money. According to me, we should use a video converter for converting the formats as well as size of the desired video. The main features of a video converter is to convert the video formats, video size, video length, video quality, video resolution and much more in a desired one. Now the biggest deal, how you will find the best video converter? It has a simple answer, while choosing the best video converter; the first thing you must keep in your mind is what you want from your video converter? Do you want only a video format converter or a video size converter or anything else? At first, Make sure about your need, and then start search for a video converter which fulfills your need. I think this would be the best and simplest way to find a best video converter. Here In this article, you will get information about the top 10 video converters available in market. Read the features and functions of each video converter and then choose. The best video converter in my opinion is Kigosoft. The interesting part about this converter is its conversion rate, means it converts video at high speed conversion rate. The output video you get will be in good quality. It provides a feature which can converts video in audio formats and even converts audio formats to another audio formats. Not only this, it also provides a feature which converts a group of videos all together in other format. The second best video converter is videora. 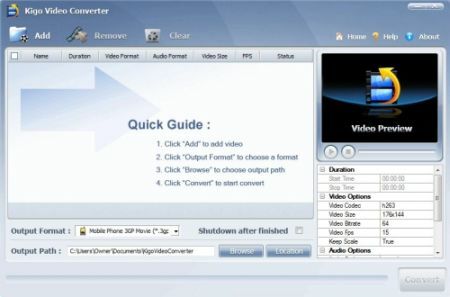 This converter has many options in their setting box for converting video format. Rather than this it can convert video files, DVDs, CDs and YouTube videos into a desired format. This video converter can convert video files in almost all the formats that your portable video player device supports. It has a list of video formats which supports in your portable video player device, so you will not be bothered anymore for changing settings for each device. The software is totally free for use and the installation is also easy, you don’t need any third party software for installing. Another best video converter for Windows. Any video converter gives a powerful conversion rate with the high quality output. This converter supports a lot of formats which handle your all type need about the video formats. It supports Flash FLV, MPEG-4, MPEG-I, MPEG-II, DVD PAL, DVD NTSC video files and many more. If we talk about the interface, then, this video converter has very easy and simple interface. You will get every option which you need while converting a video on the main screen itself. 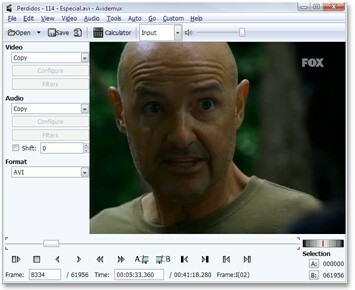 Any video converter is a freeware, which allows you to use its all features without spending money. The fourth best video converter in the list is Free Video Converter. It supports a lots of formats to be converted such that MP4, AVI, 3GP, PSP, iPod, iPhone, Zune, MKV, ASF, WMV, MOV, MPEG, VCD, QuickTime, RM, VOB, MTS, M2TS, AVCHD, and many more. Not only this, you can also set the start and end point to cut any part from that video. It gives an ability to extract audio from the video files. Another best video converter for converting almost all kinds of videos formats in your desired one is AVS video converter. This video converter gives lots of option in its setting box. You can create a DVD by using the DVD menu. 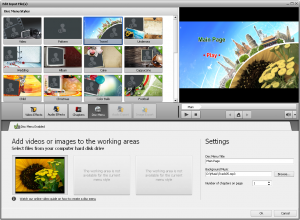 Rather than this, it gives an HD video managing option which allows editing, splitting, trimming, adding effects on the videos and converting them into a desired format. With this converter you can also converts Blu-Ray Videos. It includes many additional features such that adjusting aspect ratios, setting starting and ending points, extracting audio from video, editing video and many more. Free Studio has a bundle of few freeware’s which has a total of 24 utilities of audio and video. With this software you can convert videos in your desired format, burn DVDs and CDs and even download/upload video files to your device. You can also do basic editing in video or audio with help of this software. It is a freeware; hence you don’t need to spend any money for using it. Another popular video converter is Prism. This converter supports almost all video formats and can perform conversion very gently with high conversion rate. Generally it supports MPEG, MP4, WMV, AVI, MOV, FLV and many more formats. The most interesting part is it compresses the video files which in result takes very much less time to be convert. Clone2Go is also a video converter which offers a great deal for converting videos. It gives an ability to convert group videos. Clone2GO ensures about the high speed conversion which gives the output video files in very short of time. Overall, it supports almost all formats to convert. It also gives an option to download and converts the videos from YouTube and Google. Another great video converter tool which supports not only in windows but also in Linux and Mac OS. The video converter supports almost all video formats that we need for our portable video player device. It has many features such that cropping, scaling, live preview, subtitles management and many more. The last but not the least, K-Lite has all features for converting a video format in high quality. It supports almost all formats with many additional features such that burning DVDs or CDs, setting start and end points and many more. Overall, K-Lite is a nice tool for converting video formats with ease. Top 10 Companies That Made Themselves Count !